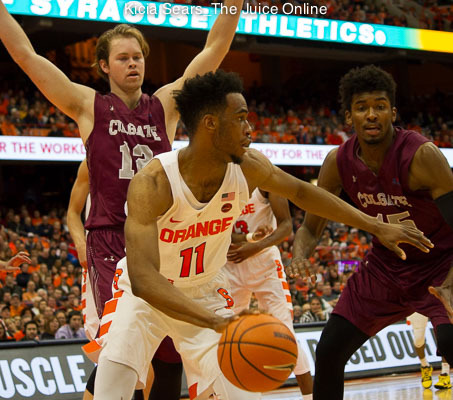 HomeBasketballHow does Oshae Brissett compare to recent Syracuse freshmen standouts? How does Oshae Brissett compare to recent Syracuse freshmen standouts? Going into the season, there were questions about who would step up and lead the Syracuse basketball team after Tyus Battle. Although certainly not guaranteed, Frank Howard’s role as second option didn’t exactly come out nowhere. But not far behind has been the standout play of freshman Oshae Brissett. After finding success recruiting players like Kris Joseph and Tyler Ennis from Canada, coach Jim Boeheim again visited our neighbors to the north to pluck Brissett, a Toronto native. Brissett’s freshman campaign has been one of the best Syracuse has seen since some guy named Carmelo Anthony. After Saturday’s 25-point, 14-rebound effort against Georgetown (where he scored 24 points and grabbed 10 rebounds in the second half), Brissett is averaging 14.7 points and 9.7 rebounds per game in his first 10 collegiate games. Take Brissett’s numbers and plug them into that list. Where does he fall? Anthony certainly is the cream of the crop. But after that? You could make a case for Brissett’s numbers to be second best. Did you notice something else about the guys on that list? Except for McNamara (who ended up having one of the best careers on the SU hill) and Battle (who is still writing his Syracuse story), everyone on that list has one thing in common: they all heard their names called in late June at the NBA Draft. Brissett’s in good company. Now, I know Brissett just hit double digits in career games at Syracuse and the season hasn’t even hit conference play yet for the Orange. Against stiffer competition, there is likely to be some regression to the mean in Brissett’s stats. But aside from the box scores, Brissett’s game has a lot to like. At 6-foot-8, 210 pounds, he’s got a solid body on which to build upon. His ability to attack the rim and rebound the basketball are more commonly found in older, more experienced players. And at 19 years old, he has no glaring holes in his game, possessing skill in many different areas. Very quickly, Brissett has passed the eye test. 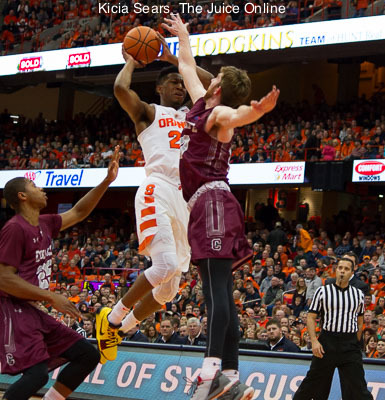 Brissett has given Syracuse a third guy capable of shouldering the scoring load at any time. Case in point, against Georgetown, Battle, Howard and Brissett combined to score 73 of Syracuse’s 86 points. The trio averages 49 points per game this season, accounting for nearly 68 percent of the team’s points. 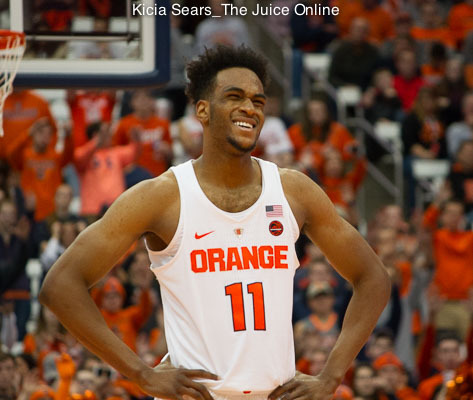 Thus far, Brissett has not only acquitted himself nicely, but has also provided a pillar of production for the Orange, the likes of which have not been seen very often from a freshman.